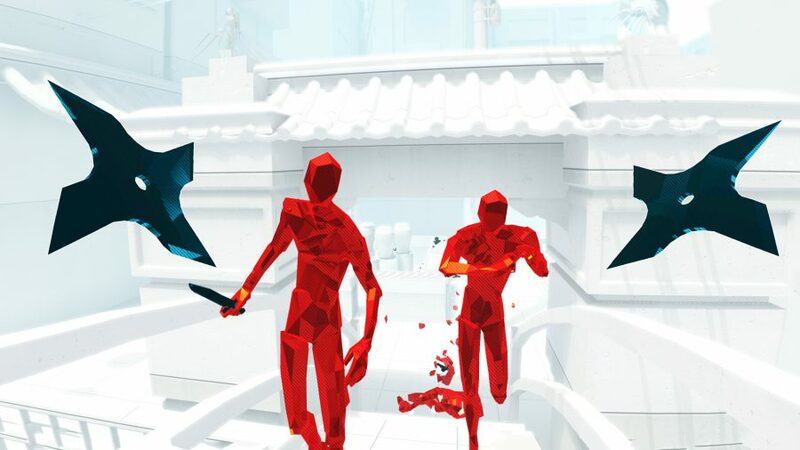 April 2019 update: developers have just announced that Superhot VR has outsold the original Superhot. A well earned achievement for a game which is best experienced in VR. One of my favorite games from the last few years is a first person shooter game called Superhot. It has a distinct and memorable minimal aesthetic, but what really separates it is a unique mechanic which makes it more of a strategy or puzzle game than a shooter: time only passes in the game as you move. For example, you start a level surrounded by enemies who are motionless, and as you move, they move to eliminate you. The game is basically a series of scenarios where you confront armed enemies who appear like minimalist low-poly characters in a stark white, Matrix-like environment (specifically the scene of the first movie where Neo is armed and trained by Morpheus). It offers a surreal sense of presence, as you feel like Neo dodging bullets and ducking under flying fists in slow motion. I completed Superhot in 2016, the year that it was released by “Superhot Team”. Years prior to its release, it was a gamejam winner (in 2013) and was then successfully funded on Kickstarter before seeing a commercial release in 2016. Without spoiling anything about the game itself, it was clear to me when I completed the game on Steam in 2016 that it was perfect for VR. So it comes as no surprise that that’s such a unique and memorable experience in VR. The low-poly minimal aesthetic of the game perfectly suits the limited resolution of the current generation of VR hardware. Battlezone is another game which does this very well. The stark minimalism of the simple objects which these games are made of look fantastic in 2019, even on what will clearly be viewed as limited devices just a few years from now. At about three hours in length, it’s not a particularly long game. But for me, this might be the sweet spot in terms of length for a VR experience. It’s after this length of time that I feel fatigue and discomfort in VR. After you complete the main campaign, there are additional challenges to complete, which extend the length of the game considerably. It’s a good workout, as well. You’re progressing through the levels in slow motion, as you duck behind virtual objects, slowly moving arms your arms and head to dodge enemies and strike at, or shoot targets. It is truly a “full body” VR experience, in that you keenly aware of the position of your head, extremities, and body in the VR space. It’s a truly remarkable VR experience. Superhot VR is available for SteamVR and PSVR. I played it on PSVR.